One of the most iconic images from The Goodies is their three-seater bike, the trandem. Not everyone realizes there were actually three different style trandems over the nine series of The Goodies television show. The following "spotter's guide" to the different trandems is intended as a fun (and perhaps even useful) resource. I've made up the identifiers for ease of use in this document. I'm afraid I don't have any official data about the making of the bikes; I'd be very interested to hear from anyone who does. 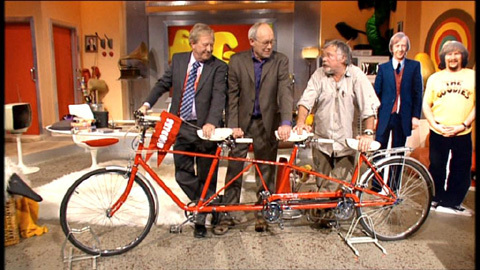 The Goodies' first bike was actually a modified tandem. A standard two-seater bike was given an extra seat and a set of footrests for a third rider. This bike was used throughout the first series of The Goodies. In interviews, Tim & Graeme will jokingly complain about Bill being "baggage" on this model (while Bill happily says how nice it was to let the other two do all the work). In reality, Bill having to balance on the back without pedaling made the first version of the trandem difficult to ride. This lead the Goodies to rewrite the first episode (Tower of London) to include a routine involving falling off the bike - they realized that if they couldn\'t ride it well they might as well fall off it in a funny way. Their expertise with the first trandem noticeably improved by the final episode in the series (Radio Goodies). The second trandem is the one most associated with The Goodies. The true three-seater was introduced in the second series and used for the rest of the show's run on the BBC (from 1971-1980). 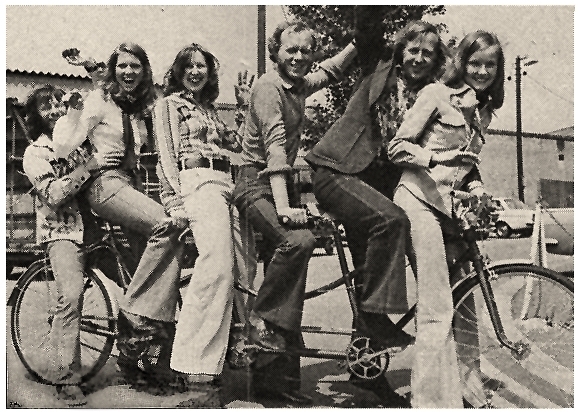 The trandem was an extremely popular feature; in recent interviews the Goodies have claimed that when they filmed on location people often seemed more excited about seeing the bike than themselves. As the years went on the Goodies found increasingly inventive ways to use the trandem. Besides being their source of transportation (on the ground, and occasionally hooked up to a hot air balloon), the trandem was used to tow a number of items such as the Goodies mobile office (The New Office), the Loch Ness Monster (The Loch Ness Monster), and a rather suspicious giant can labeled "Tomato Soup" (Clown Virus). It was ridden blindfolded (Winter Olymipcs), used as a ground-based substitute for a World War II bomber in a battle against a Dodo (Dodonuts), hijacked by one of Graeme's monstrous creations (Frankenfido) and even served as the Goodies trusty stead in a medieval joust (Camelot). It's little wonder the trandem has such a fond spot in the hearts of Goodies fans. In the episode The Goodies and the Beanstalk Graeme announces they must sell their most valuable possession, the trandem; Bill protests about selling "Buttercup". This joke refers to the selling of the family cow from Jack & the Beanstalk; it is the only instance of the bike being called by this name. Besides appearing in the television series this trandem frequently turned up in photos or drawings on the covers of many of the Goodies' books, albums, and video/DVD covers (which can be seen elsewhere in this guide), further cementing its association with the trio. They even devoted a chapter to it in The Goodies Book of Criminal Records. Several years after The Goodies finished production at the BBC the trandem was sold in a BBC props auction to Rory Spowers' brother. 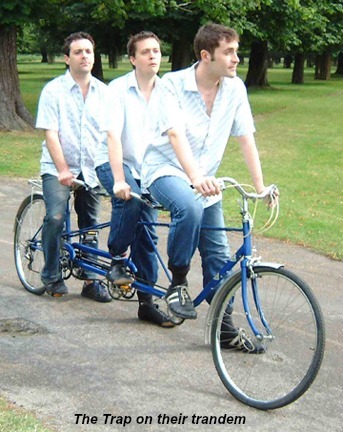 Rory and several friends decided to ride it across Africa to raise money for charity; their adventure is chronicled in the book Three Men on a Bike (which can be seen in this guide at the end of the Goodies Books page). When the Goodies left the BBC they had to leave their faithful red trandem behind. However, a new bike was introduced for their move to LWT - a more modern looking blue model. The blue trandem makes its most prominent appearance in the ninth series episode A Change of Life (in which the Goodies recreate their falling off the trandem routine from the very first BBC episode, Tower of London). As explained in The Goodies Fan Club Clarion & Globe newsletter issues #102 (http://www.goodiesruleok.com/newsletter.php?issue=102) and #104 (http://www.goodiesruleok.com/newsletter.php?issue=104), the blue trandem was built in 1980 for a Kleenex TV commercial (for Kleenex's "Super 3" line) which featured the Goodies. It was subsequently used in the filming of their LWT series. The blue trandem was sold as part of a 1987 Sotheby's auction of "Veteran, Vintage and Classic Motor Vehicles, Motorcycles and Automobilia". (An interesting piece of trivia is that a publicity photo of the Goodies from the Kleenix ad adorns the back cover of the Sotheby's catalog). The trandem was bought by a private collector, who kept it until 2003 when he decided to sell it on eBay. The new buyer only intended to keep the trandem for a short period of time, as he'd bought it to use for publicity and free advertising, and so the bike was auctioned on eBay for a second time in May 2004. This time it was rather appropriately purchased by another three man comedy group, The Trap (http://www.thetrap.co.uk), which is comprised of Dan Mersh, Paul Litchfield and Jeremy Limb. Jeremy said, "we're indebted to the Goodies, our humour is also quite visual and silly in the best sense of the word! So we're very excited about our new purchase. Now we just need to practise riding it..." The Trap brought the bike with them to the 2004 Edinburgh Fringe comedy festival. The blue trandem was loaned to the UK chat show Richard & Judy when The Goodies made an appearance in February 2005 (Tim cheerfully took it for a spin around the parking lot while Graeme & Bill gave him an encouraging thumbs-up). This trandem, repainted red, also made a "guest appearance" in BBC 2's Return of the Goodies special (broadcast to 3.4 million viewers on 30 December 2005). Dan Mersh (of The Trap) explained, "although the production company who made Return Of The Goodies did indeed paint it red for that show, we insisted that they use a removable paint and that it be returned to us in its original state which indeed it was. It is now back to tip-top condition (after we bought it it needed a fair bit of work to make it roadworthy)."